You can always turn to Julie Cantrell for stunning language, heartfelt stories, and flawless character development. 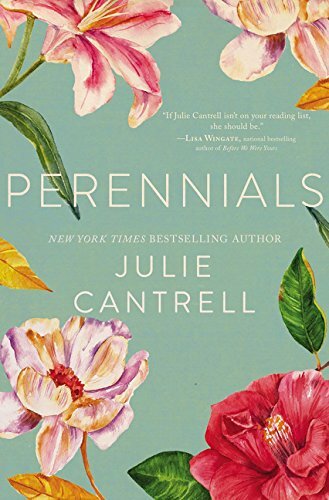 Her latest novel, Perennials, is no exception, and the reader will get invested from the very first page. Lovey Sutherland’s Arizona life, complete with her successful career as an advertising executive, her centering yoga routine, and her supportive, loving friends, is, on the surface, what she has always wanted. Free from the past she left behind in her hometown of Oxford, Mississippi—and the blame she faced when a fire in her childhood, perceived to be her fault, changed everything—in many ways Lovey has created the future she has always imagined. Even still, as her 45th birthday approaches, Lovey can’t seem to heal her broken relationship with her golden child of a sister, escape the blame she still thinks her parents and her town place on her for that long-ago tragedy or forget the marriage proposal she turned down and the man she left behind. When her father begs her to come back home for three weeks for a 50th anniversary surprise for her mother, Lovey initially says no. With all she has going on at work, not to mention the scrutiny she is sure to face from her sister and her town, it’s a risk Lovey isn’t willing to take. But when her father reminds her that it’s “family first,” Lovey realizes that this is something she owes to the people she loves most even if they haven’t always extended her the same courtesy. She puts her life on hold to help her father with a secret project—a beautiful and sentimental garden that contains relics of the most memorable parts of his and her mother’s 50 years together. Lovey rediscovers some of the best parts of her childhood, finally gets some of the answers she seeks, and discovers that perhaps it isn’t too late for true love, love like her parents have, to find her once again. Perennials portrays a female heroine who is 45, single and has made her own way in the world on her own terms. She is recovering from a particularly harrowing break up, but doesn’t let her relationship status define her. Lovey has a perfect mixture of vulnerability and strength, and, like all her characters, Cantrell treats her with grace and respect. The sister relationship in this book, while frustrating at times, rings true. Cantrell portrays difficult family dynamics that so many people face without them becoming a caricature—or fodder for a cheap laugh. All in all, with languid prose and vivid description Julie Cantrell’s novel unfolds as beautifully as one of her protagonist's favorite flowers. Cantrell weaves moving and inspirational stories that make her one of today’s most beloved storytellers. Perennials may be her most breathtaking yet.